This is the way minestrone is made in Romagna. It's not a lot of prep time, but you simmer the soup for a long time until all of the vegetable flavors mellow into one mild but delicious soup. The subtle flavors of this soup are even more delicious the next day, so it is a good dish to prepare in advance of guests arriving for a weekend, or to bring on a ski trip. Other than the onion, pretty much all of the vegetables can be substituted for other vegetables that are available, on sale, etc. I recently cooked it without the zucchini and it was still delicious. This is another dish adapted from Marcella Hazan. Optional: Crust/rind of the parmigiano-reggiano cheese that you grate for the soup, cut free from the cheese and cleaned. The preparation (mostly dicing) for this dish can be done while the vegetables are being sauteed. Here is the ideal order, but only the Onion needs to be done in this order. Soak Zucchini for 20 min. Then trim ends and dice fine. Choose a large stock pot, put on medium-high, and add the oil, butter (optional) and sliced onion. Cook for 3-4 minutes until onion is translucent. Add the diced carrots, cook 2-3 minutes stirring at least once. Add the celery and cook 2-3 more minutes. Add the potatoes and cook 2-3 minutes. After a few minutes, add the broth, water, cheese crust (optional), tomatoes with juice, and a sprinkling of salt. Thoroughly stir the pot. Cover and lower the heat, adjusting so that the soup bubbles slowly at a steady simmer. After 2.5 hours add the drained cannellini or white kidney beans. Stir well and cook for another 30 minutes. You can turn off an resume heating later at any point. The consistency should not be thin and watery...it should be thick with vegetables. If it is too thick for your liking, though, you can dilute with a cup of broth or water. When the soup is done, remove the cheese rind, add the grated cheese, taste and correct for salt. It will likely need quite a bit more. I would recommend turning off the soup and letting it sit for at least thirty minutes uncovered to cool. Serve with freshly ground pepper on the table and encourage adding pepper to taste. Serve with a dry, crusty Italian bread. This soup does not have as much tomato flavor as you are probably used to in many minestrones. I like it that way. However, if you love tomato you can easily add a couple of tablespoons of tomato paste with the broth. Try it first with less tomato though and give it a chance! Subtle but delicious! This is a really good and good-for-you minestrone. Would definitely make this after trying it at John's house. 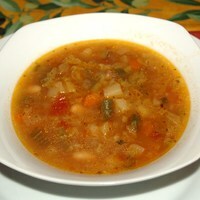 It's not as rich as other minestrone's I've tasted - I believe John left the butter out. I'd do the same! I enjoyed this as much the second day as the first. Our kids continued to eat it all week. Tasty and healthy! I haven't made it yet but when you said you left out the zucchini and there isn't a lot of tomato taste I have to try it. I won't eat zukes and hubby doesn't like tomato soup. This soup is delicious. The tomato flavor is very light which I like a lot. It's very thick and rich. I didn't use the entire amount of olive oil but I did add the butter. My husband even likes this and he doesn't like soups, claims they aren't filling enough. Keep 'em comin' (the recipes that is). Thank you. Thanks for the thoughtful and detailed review, Eddy. That really helps others make a decision on the recipe. Thanks for taking the time and glad you and your husband enjoyed it! I am not a soup eater, but I loved this as did my husband. 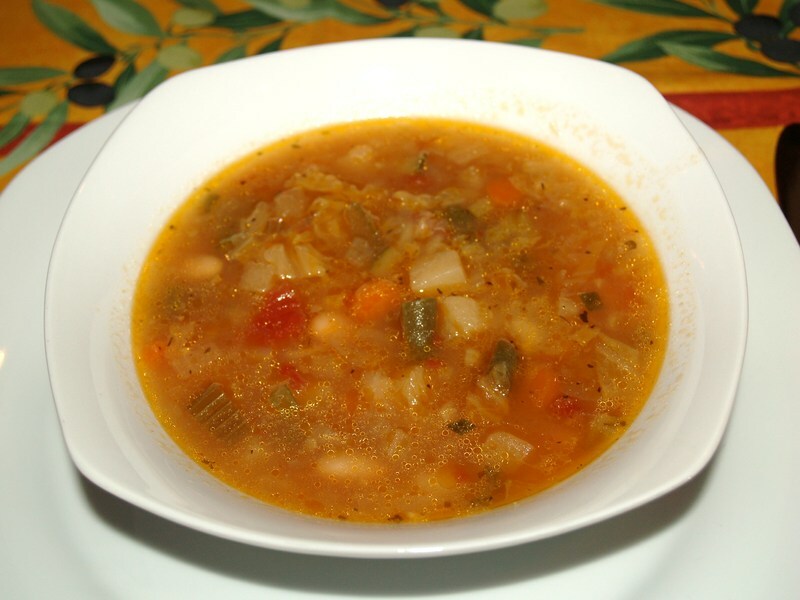 A perfect minestrone recipe. The key is the long simmer time. I'm not sure if the timing and order of the initial cook makes much difference. I just added everything together and stirred until it started to sweat before adding the liquids. I also added about 1/2c finely shredded parm since I didn't have a rind, and I think that blended pretty well to add some richness. Made this last week. I used half the amount of olive oil and rough chopped the veggies. I also added three vine ripened tomatoes, chopped into smallish pieces. It was delicious! Great sounding recipe! I think this is something my whole family would eat (and that's rare! ), so I'll have to try it.